If only the M For Montreal programmers had booked Lydia Ainsworth for a longer set, because the people in attendance — myself included — could have listened to her perform all night. 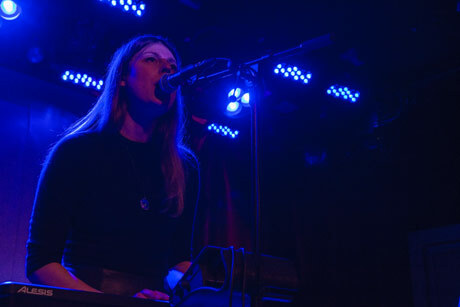 Having gotten her start studying scoring film, Ainsworth developed an interest in electronic compositions, culminating in this year's excellent Right From Real on Arbutus Records. Backed by a three-piece band that included a cellist, violinist and drummer, Ainsworth and her band managed to infuse every song with a sense of grandeur, obviously fuelled by her past endeavours. As she launched into "The Truth," the room was entirely captivated, as she managed to keep the notoriously chatty M For Montreal crowd at a quiet hush instead of the all-out gab fest that greeted most of the other sets that night. There was an outstanding musicality to the performance, especially during Right From Real highlight "PSI," as well as the kickdrum-heavy and beautifully composed "Hologram." The set ended with fan favourite "Malachite," whose mineral name-dropping spoken word breakdowns worked wonderfully with the string and drum arrangements. And then, all too suddenly, it was over after a short 25 minutes. Hopefully next time she'll be afforded a much longer set.